Some time ago I wrote a post about portable beading and how I made up a container with everything I needed. Well I’ve changed it. For something better. 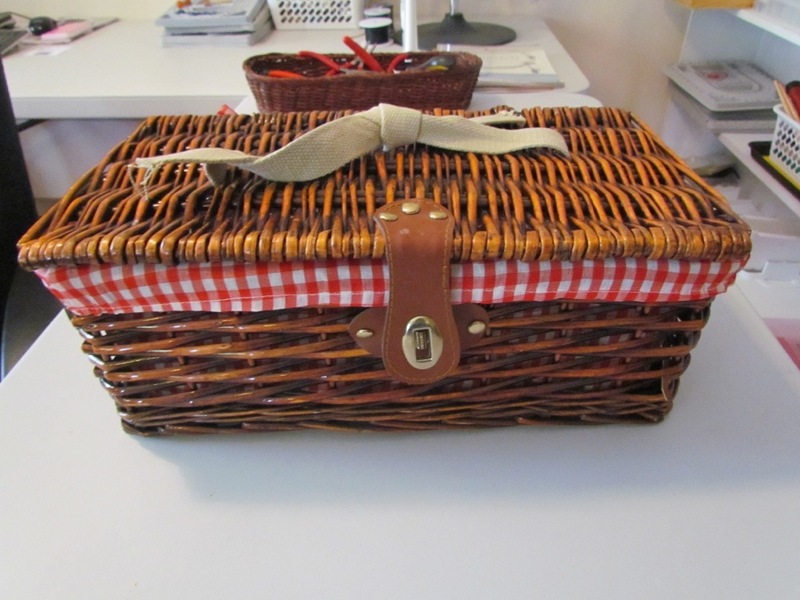 I found this basket in a second hand shop and thought it would be perfect for my needs. 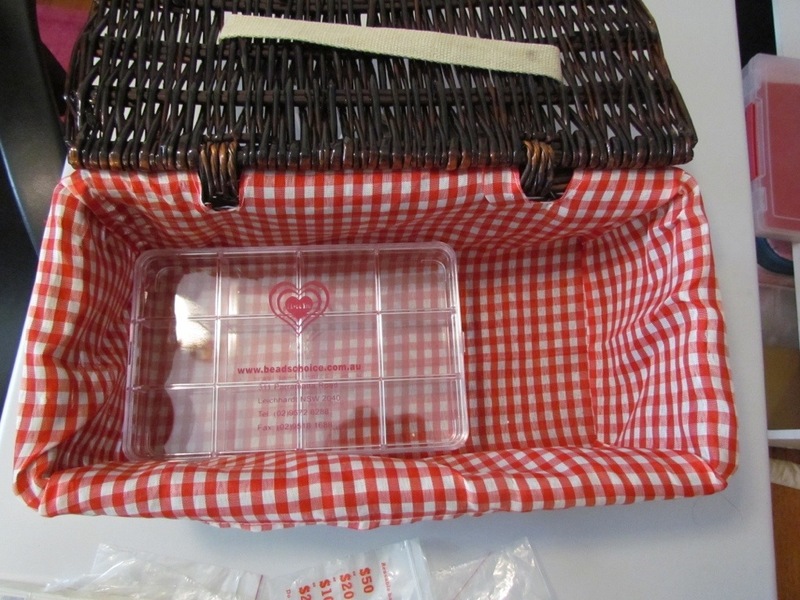 It is more than perfect, it fits my container I will be using brilliantly. And if I need to take a beading mat it is simple to take the other portable beading kit. 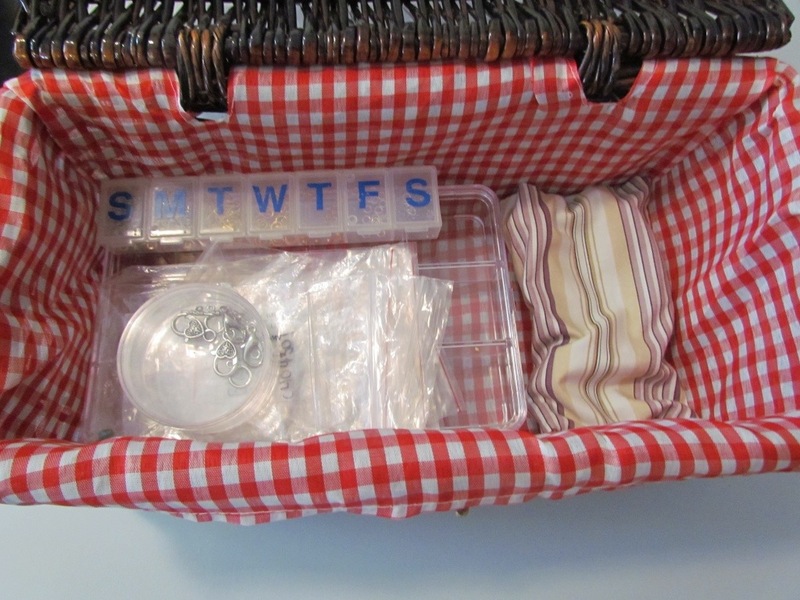 I will also be getting one of those half size mats, perfect for bracelet sized pieces to put in my basket. This basket has handles on the side, but I though this would upset the contents so I found an old belt and looped it through to make a handle in the top. The storage container I was given at Christmas will work well I thought. Not just well, I sized it up, and it is exactly the right width to sit nicely on the bottom of the basket. This will then hold all the bits and pieces, findings, like pins and clasps, ear hooks and spacers. The beads and wires I want to take will go into snap lock bags. A purse I made will hold all my pliers – so they don’t get caught on anything, and I may just include a notepad and pen. As you can see, I haven’t fully filled it yet. The pill holder currently has some ear hooks, jump rings and crimps. The rings and crimps will stay in this set up while the bigger items will go into the other container. The loose bags are for any beads and wire, and the cute little stripy bag has my pliers in it. Next time I take it away I will get a picture of it all packed up to show you. I took this set up to the last market I did, well most of it. All I was doing were memory wire bracelets, but the basket worked well. It will be for any portable beading and a repair kit/boredom killer for the markets. If I am able to shorten a chain, or add a few extra loops while they are waiting it can make the sale. Especially as a lot of the visitors are from out of town. 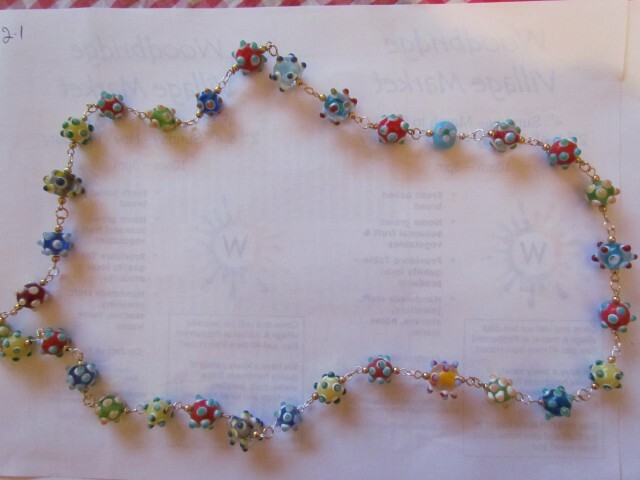 Ideally it will be always ready to go, and I just have to add my beads and tough pliers if required. Can your craft be portable? How do you organise it? Does it work? This entry was posted in Beading, Craft Shows & Markets, Misc craft posts and tagged Basket, beading, containers, craft, crimps, ear hooks, easy craft, jump rings, markets, pins, portable, storage. Bookmark the permalink.